I adapted this recipe from The Veggie Table. I call it coconut pad thai because the coconut milk gives the sauce a lightness but doesn’t take over. 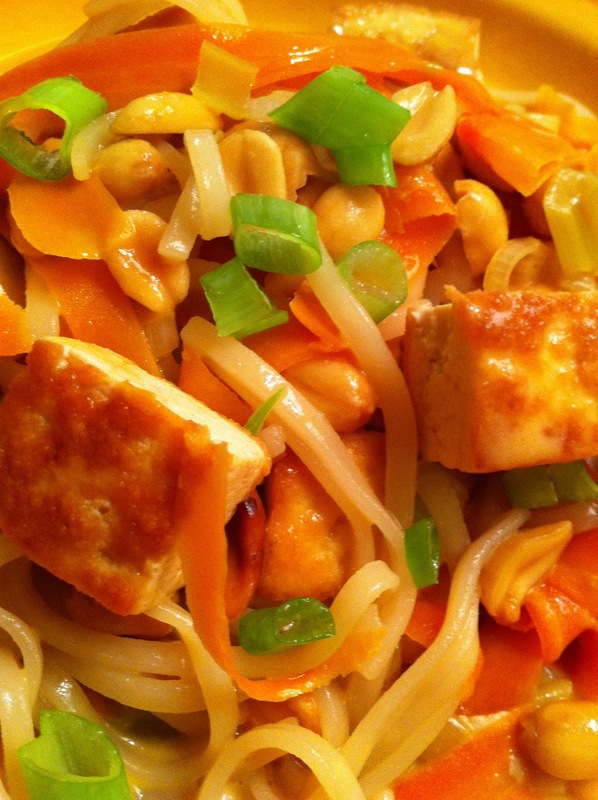 The pad thai flavors are all there and it is super easy to prepare. It makes enough for 4 healthy servings. Boil the noodles according to the directions and when done, rinse under cold water and set aside. Prepare the sauce by mixing the tamari, vinegar, mirin, and maple syrup. Set aside. In a non stick skillet, heat up high heat oil and brown the tofu on as many sides as you can. Chop up the scallions using the white and green parts but save some green for garnish. Using a carrot peeler, peel the carrots until there is no carrot left, like ribbons. Heat up the sesame oil and saute carrots for a few minutes until soft. Then add the scallions and cook for another minute. Add the sauce, stir, and let simmer for a minute. Then add the coconut milk and the tofu. Stir to coat using a wooden spoon and let simmer a little while longer. Add in the peanuts squeeze in the fresh lime juice. Add in the noodles and stir around to coat them thoroughly. Top with scallions and more peanuts. (It tastes better after it has sat for a few minutes and the flavors have time to come together.) Enjoy!